As part of the 2nd comprehensive pesticide lab survey the EURLs conducted a survey about the impact of the EURL activities on the EURL/NRL/OL-Network. The EURLs would like to thank all participants for the lively participation and the motivating feedback! Comment: The vast majority of the staff working in the official laboratories (91%) indicated that the creation of the EURL/NRL/OL-Network concept is either very useful or useful. This clearly demonstrates that the pesticide residue analysis community has widely accepted and embraced the concept. Comment: Overall 89% of the respondents have indicated that the development of the Network in the last 4 years has been either strong or very strong, thus showing that the work of the EURLs in establishing and strengthening the network is positively recognized and appreciated. 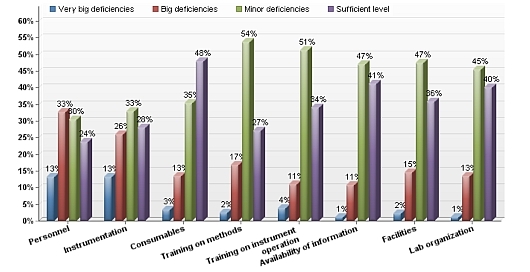 70% of the network-members that participated at this survey rated the impact of the EURL-activities on their lab`s development as strong or very strong with EUPTs and information dissemination being the activities with the highest impact. 84% of the survey participants indicated that the EUPTs had a very strong or strong impact on their laboratories. EUPTs are organized annually by each EURL. Occasionally ad-hoc PTs are also conducted upon request by the COM. The results of the EUPTs are published in detailed reports and discussed in workshops. 77% of the survey participants indicated that the information dissemination by the EURLs had a very strong or strong impact on their laboratories. This activity has been promoted with great diligence by the EURLs with the creation of a common web-portal (this website) and a datapool with numerous databases containing valuable information for pesticide residue analysts. An internal document repository was also installed using the CIRCA platform. 72% of the respondents belonging to NRLs indicated that workshops contributed strongly or very strongly to the development of their labs. It should be noted that workshops are mainly directed to NRLs with OLs only participating in certain workshops. 60% of the survey participants indicated that the methods provided by the EURLs had a very strong or strong impact on their labs. Pesticides included in the coordinated control programs (CCPs) are put higher priority in the EURL method development activities. The methods are distributed through this webiste and further promoted via oral presentations and training courses during the EURL/NRL workshops. The implementation of the methods in the labs largely depends on the situation in the labs (equipment, personnel, workload). 44% of the survey participants considered that the personal assistance by EURL-staff has had a very strong or strong impact on the development of their labs. Comment: 96% of the network members rated the EURLs as very active or active. This demonstrated a high overall recognition with the work done by the EURLs. Comment: According the responders the most important factors that hinder laboratories from developing are the shortage in personnel (46% with big or very bid deficiencies) and in instrumentation (39% with big or very bid deficiencies). Both are areas where the EURLs have practically no influence. The only areas where EURLs can have an influence through their activities are the training on methods, the dissemination of information and partly the training on instrument operation. Due to the large scope of different instrumentation the latter is more reasonably done by the vendors although some training activities among the laboratories within the network would be conceivable for the future and could be promoted by the EURLs. Training on methods is given to the NRLs with the NRLs being responsible of disseminating this information and ideally providing training to the OLs. The area where the laboratories have the least deficiencies is the "availability of information" surely also thanks to the great EURL-efforts in the area. can be found here: CLICK HERE. Link to Survey Overview: CLICK HERE.